The last couple of weeks I have daily visited the website My Inner World. This has been such a great inspiration to me and lots of good things have happened to me since the first day I started the guided journeys. It's as if I'm only attracting the good stuff right now. Everything is becoming so much clearer to me and I can better focus on the NOW. If you register to this website you can follow the guided journeys and keep all the information you gather in your private journal. 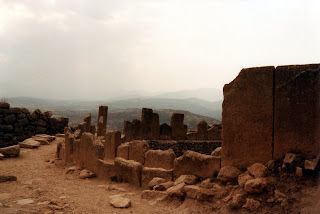 The photo has been taken at the Citadel at Mycenae in Greece in 1978. I love this photo because it has something mysterious.